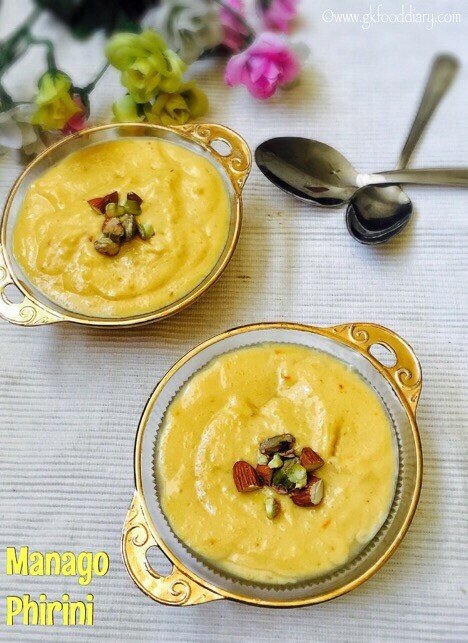 Mango Phirni – a famous North Indian dessert made with mangoes, basmati rice, nuts and milk. Who can say no to mango desserts? Mango phirni is one of the easiest mango dessert that anyone can make at home when you crave for something sweet. It’s so creamy and tasty, But I had to stop my temptation till I clicked the pictures:) We and our little one enjoyed the mango phirni very much!!! 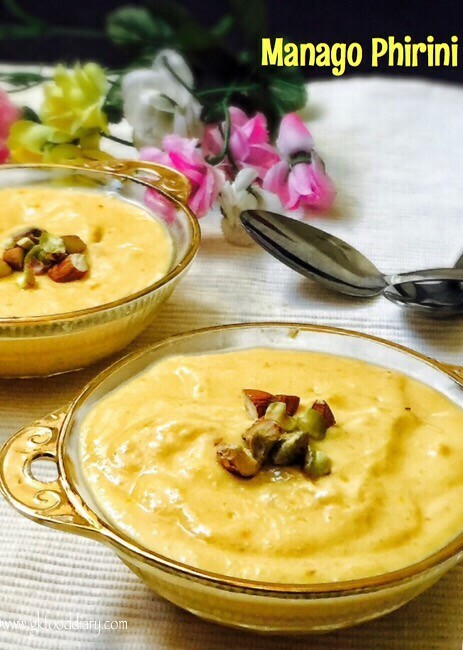 This mango phirni is ideal for babies from one year as a quick dessert. 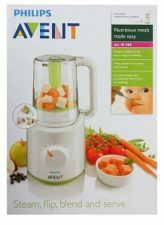 Do give a try and am sure your little one & the whole family will like it! 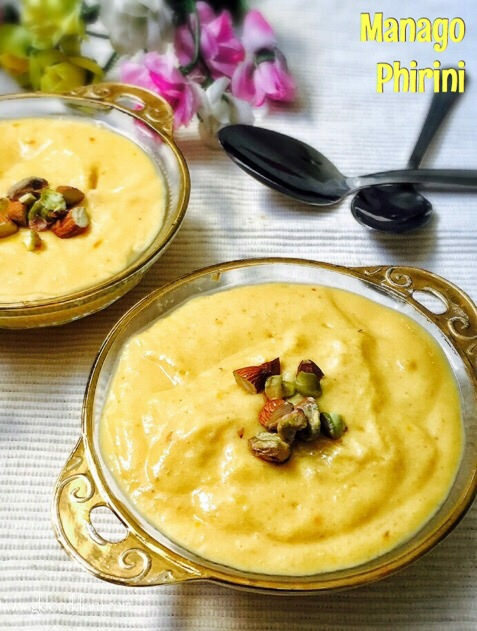 Now let’s get on to check this delicious mango phirni recipe. 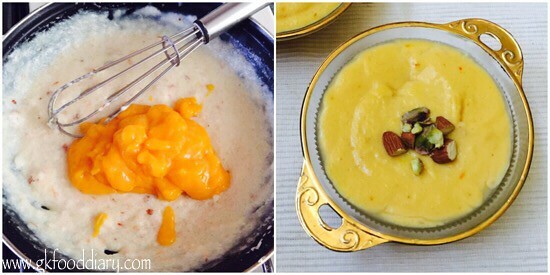 Mango Phirini - Easy and yummy dessert recipe with rice, mango, nuts and milk. Keep all the ingredients ready. Wash and peel mangoes. Mash or puree the mangoes, keep it ready. 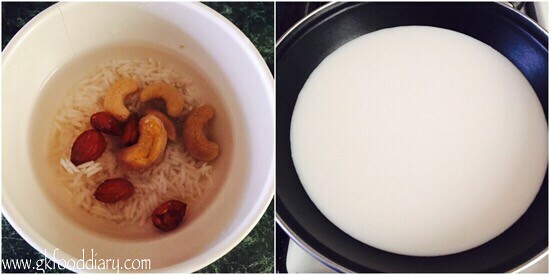 Rinse rice well and soak it in water along with cashews & almonds for at least 15 minutes. Peel the skin of almonds if desired. Set aside. 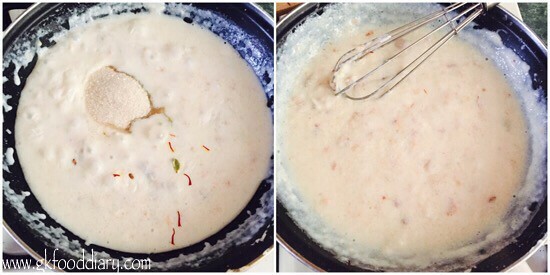 In a thick bottomed pan, take 2 cups of milk and simmer it for 10 minutes. In a blender grind soaked cashews & badams and rice together to a slightly coarse paste by adding little water. Set aside. Once the milk becomes slightly thick, add rice paste. Also add crushed cardamom and mix well. Now cook everything in a low flame for 10 to 12 minutes or until rice gets cooked well. Make sure to stir it occasionally otherwise the rice may stick at bottom. Once the rice is cooked, add sugar and saffron. Mix well and cook until it becomes thick and pudding like consistency is reached. It may take 5 to 7 minutes. Once the phirni is ready, add mango pulp. Mix well and switch off the flame. Once the mango Phirini is cooled down, pour it in serving bowl and refrigerate it for at least one hour . 1. Keep all the ingredients ready. Wash and peel mangoes. Mash or puree the mangoes, keep it ready. Rinse rice well and soak it in water along with cashews & almonds for at least 15 minutes. Peel the skin of almonds if desired. Set aside. 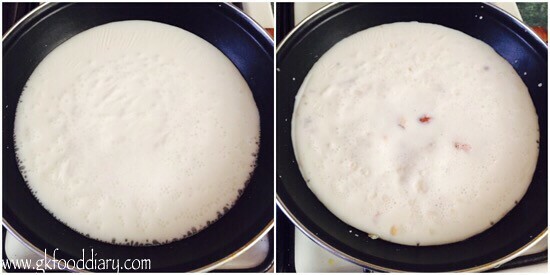 In a thick bottomed pan, take 2 cups of milk and simmer it for 10 minutes. 2. 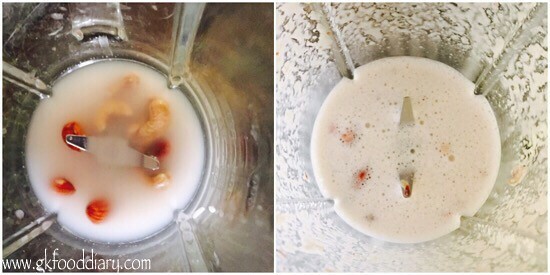 In a blender grind soaked cashews & badams and rice together to a slightly coarse paste by adding little water. Set aside. 3. Once the milk becomes slightly thick, add rice paste. Also add crushed cardamom and mix well. Now cook everything in a low flame for 10 to 12 minutes or until rice gets cooked well. Make sure to stir it occasionally otherwise the rice may stick at bottom. 4. Once the rice is cooked, add sugar and saffron. Mix well and cook until it becomes thick and pudding like consistency is reached. It may take 5 to 7 minutes. 5. Once the phirni is ready, add mango pulp. Mix well and switch off the flame. Once the mango Phirini is cooled down, pour it in serving bowl and refrigerate it for at least one hour . Tasty and yummy mango phirni is ready! Serve chilled ! You could use any sweetener of your choice. Always use whole milk to get thick phirni. Make sure to not to grind rice paste finely, it has to be a coarse paste. Make sure to stir it occasionally when rice is cooking otherwise the rice may stick at bottom. 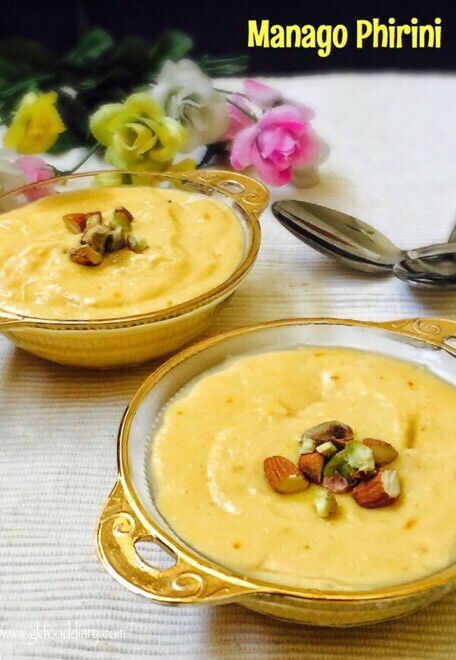 This mango phirni becomes thicker when cooled down. So switch off the flame when it is little thick. Very easy and quick recipe. Tasted delicious. Thanks for all you efforts with these baby and toddlers recipes.